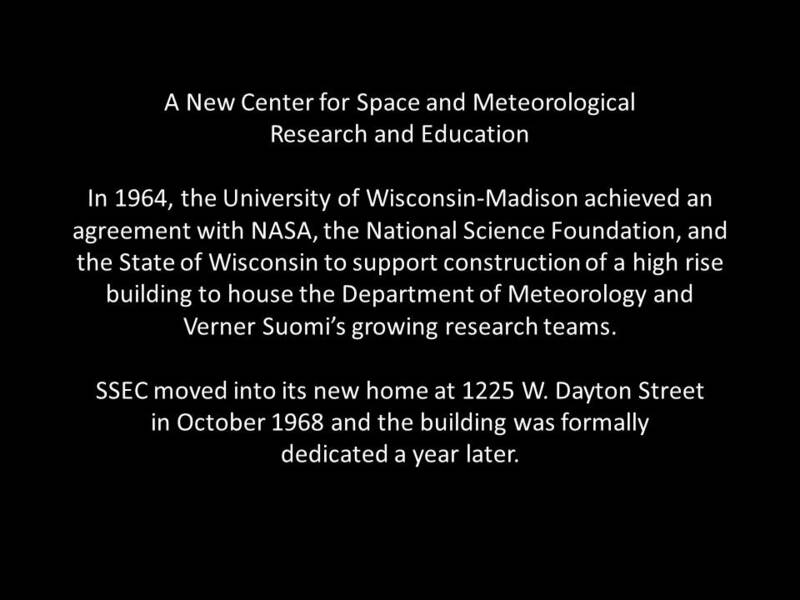 This year, the Space Science and Engineering Center (SSEC) at the University of Wisconsin-Madison celebrates its 50th Anniversary: a living legacy of research, discovery, and innovation. The center was founded during the pivotal scientific era of the 1960s. The first satellite had been launched less than a decade earlier. UW-Madison professors Verner Suomi and Robert Parent, experts in meteorology and electrical engineering, respectively, had invented a radiometer that demonstrated the capability of transmitting Earth radiation information from space – a novel concept. The radiometer flew onboard one of NASA’s Explorer missions: missions that encompassed a wide range of scientific experiments designed to gather data from Earth as well as planetary atmospheres. There were 89 successful Explorer missions in all, and the Suomi-Parent radiometer would be carried on the seventh in 1959. Not long after, they would prove, with the spin-scan cloud camera, that weather in motion and across time, could be viewed from a satellite in geostationary orbit. The world of weather forecasting would be changed forever with the emergence of this new era of satellite meteorology. Recognizing the societal benefits of this young area of science, the university and the state of Wisconsin would partner with the National Aeronautics and Space Administration (NASA) and the National Science Foundation (NSF) to fund the construction of a building to house Suomi’s burgeoning research programs and the Department of Meteorology. SSEC was founded in 1965, with Suomi as its first director. A special anniversary issue of Through the Atmosphere, SSEC’s biannual print magazine, providing a tangible chronology of the organization, decade by decade. An interactive timeline commemorating landmark achievements in instrument development at SSEC. A second timeline bringing viewers through the history of satellite meteorology, a field that was pioneered here. “Sky’s the Limit,” an engaging video all about the science that goes on within these four walls, professionally produced for the Big Ten Network. “Earth in Motion,” an animated composite of geostationary and polar-orbiting satellite data from the SSEC Data Center. A gallery of photos showing SSEC’s permanent home, the UW-Madison Atmospheric, Oceanic and Space Sciences building, from its construction up until present-day. These modules will be featured in an interactive exhibit at SSEC’s 50th Anniversary event September 10 at the Wisconsin Institutes for Discovery. The program will include an impressive slate of speakers from the university, state legislature, NOAA, NASA, international agencies, and many more who have longstanding connections to SSEC. Attendees will also have the opportunity to share their own memories of SSEC.